Patients and hospital staff stay in the open while the fire is being put out. 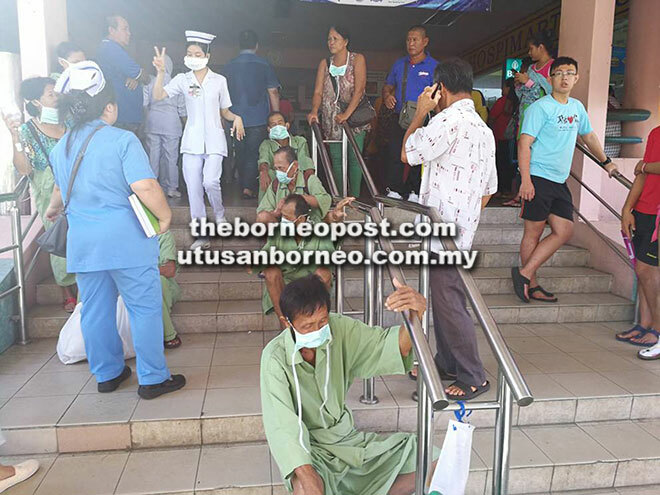 SIBU: More than 1,000 patients, staff and visitors were evacuated from Sibu Hospital about 8am yesterday due to a minor fire. The fire is believed to be caused by a short-circuit involving an air conditioner unit at Male Ward 23 on Level 2. Hospital director Dr Ngian Hie Ung confirmed the incident, saying the patients were allowed back into their respective wards shortly, except for patients at the affected ward, who are now temporarily housed in another ward. The incident occurred just as the hospital was gearing up for a fire drill in another ward (Ward 32) scheduled for10.30am. It was cancelled and all efforts were shifted to the rescue effort at Ward 23. Sungai Merah Fire Station confirmed the fire, saying they received a distress call at 8.19am. Personnel from Ulu Sungai Merah and Central Road stations rushed over to the scene, and after dousing the fire and making thorough fire safety check, allowed the patients to return to their respective wards at 9.10am.